So this is the first review I've ever posted on my blog so please bare with me. As much as I try, I'm not exactly the Temptalia or xSparkage of the beauty world! This is turning into a guru-loving ramble, so without further ado, I'd like to share with you my new favourite eyeshadow and it's not even MAC! Which is saying something seeing as I prefer MAC over any brand... This is Make-Up Forever eye shadow in shade #92. If you're reading this, you will definitely of heard of this! It seems like everyone has something positive to say about it. I for one absolutely love it! I had never tried Make-Up Forever cosmetics before, and I thought the best eye shadow to try first would be the one that everyone raves about! So I had been eyeballing it online for months, wondering to myself, 'Should I buy it or not?' My searching was brought to a stop the other day because my wonderful Youtube friend Matilda sent me a surprise package, which included MUFE #92! I couldn't believe it! I swatched the shadow on my hand and I wasn't surprised at all how pigmented and beautiful it is, because of the amount of good reviews I had read. The first make-up look I did using this shadow was just a plain purple look, because I wanted to test out it's staying power, creasing, etc. I was so pleased with the results! The colour stayed vibrant all day and it didn't crease at all. The only downside I found with this shadow is that it tends to stain your lid slightly, so make sure you prime your eyes properly and use an eyeshadow base. I would recommend the NYX jumbo eye shadow pencils for this because not only do they stop the staining, they keep your eye make up in place all day! Overall, I think this is a colour that everyone should include in their make-up collection. 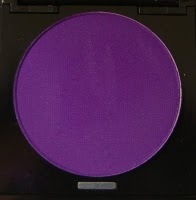 If your searching for the perfect matte purple eyeshadow, Make-Up Forever #92 is the one for you!